← Should Apple Really Consider A “Cheap” iPhone? In this article I’ll reveal a new iPhone FM Transmitter and Charger you can use in your car or with any FM radio to play the sound from your iPhone 4 and 4S. It’s a relatively simple method to give your music wings and help it travel with you. And as you will soon discover, not all transmitters are built the same and I feel it’s important to tell you why this one is unique and different that all the other transmitters on the market. You see, when you use an FM transmitter to broadcast any sound, you want the audio replicated as if it were plugged right into the radio via an auxiliary port. And when you get right down to it, the sound of the music from your iPhone is the most important piece. When you can hear it, the way it’s supposed to sound, you will enjoy it more. And this transmitter does a decent job at sound reproduction. Now this one is different than most since it wraps around the iPhone and uses a free application from the Apple store. It allows you to tap into the full public FM band and can broadcast music up to 75 feet. It also comes with a thin bumper guard, which kind of protects the facing of the iPhone, but will do little against drops or fumbles. 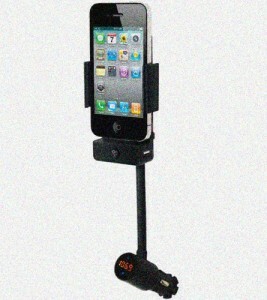 Another feature, which many will find useful, is the broadcast distance this iPhone FM transmitter and charger generates. It broadcasts about 45 feet further than the average transmitter, usually between 75-100 feet. Which is important if you would like to use it in your home as well as you car. For instance, if you are sitting in the kitchen and you have the home stereo in the living room thirty feet away, you can change the musical selection and it will still play through the home stereo. Finally, this is a truly unique item because you can charge your phone while you use it. It can plug into a USB port or your vehicles utility adapter (cigarette lighter) and easily be charged. On the back is a on/off switch which can easily toggle the transmitter on and off. It’s also important to note, the will be some extra battery drain, more than normal when you use this Apple FM transmitter. From what I’ve researched online, your battery will wear out around 10% faster. While it’s on your mind and since I promised to reveal it, Click Here or visit Charger for FM Transmitter. This entry was posted in Articles, iPhone and tagged FM transmitter, iPhone. Bookmark the permalink.